Between my pre-existing connections and the work of the book’s PR team, I’ve had no shortage of radio and podcast spots since the book appeared on the horizon. Some of them disappear into the ether immediately, but here I’ve gathered a bunch of links to the archived ones into one post. The Bernie Miklasz Show, St. Louis, July 20. Some Cardinals-related chatter here as well. Any day where get to talk Hall stuff with Bernie is a good day. WGN, Chicago, July 23. When you bring up the Hall of Fame, some people can’t let go of the topic of steroids, so it’s all the more important that I take a deep breath and talk them through my logic. The Felske Files, July 26. Interviewed by John Stolnis of the Phillies-phlavored blog, The Good Phight. The Ringer, July 27. Discussing the book and the Hall with former Baseball Prospectus colleague Ben Lindbergh and his partner in crime, Michael Baumann. The Jeff Blair Show, Toronto, July 27. On Tim Raines’ candidacy and election, the book, and other Hall stuff. Going Deep, July 28. Chatting with NBC Sports Radio’s Dan Schwartzman on the eve of my Cooperstown weekend. Chin Music, Washington, DC. July 29. Discussing the book with Al Galdi on his sabermetrically-inclined show on ESPN 980. Around the Big Leagues, Atlanta, July 29. My conversation with Grant McAuley for the Braves’ pregame show on 92.9 in Atlanta. The Jody Mac Show, July 30. CBS Sports Radio. Jaffe – whose own BBWAA voting clock started ticking in 2011 – will get his own first ballot for the 2021 class. The electorate might look considerably different by then; new rules have trimmed the number of eligible voters significantly. And Jaffe’s like-minded peers are starting to show up on the rolls as well. As a longish-time reader (and fan) of Jaffe’s work, it’s fascinating to see what he does with the room to run that a book offers. His research is exceptional and his analysis is remarkably deft; when it all comes together, it’s as thought-provoking a Hall-related read as you’re likely to find anywhere. It’s incredible – he shines a light both on beneath-the-surface greatness and mediocrity shined by empty stats and old teammates. Baseball fans don’t have to be statheads to dig “The Cooperstown Casebook” – although it certainly helps. The sheer magnitude of this undertaking will impress any lover of baseball; most baseball lovers embrace this kind of discussion regardless of which side of the subjective/objective line they might come down upon. It is smart and thorough and wonderfully informative; advanced enough for the more statistically-minded, but still engaging and informative to the layman. Outside of the player chapters, Jaffe gets into the history of the institution, building on James’s work to attack 21st-century issues like the influence of modern statistical analysis on the process. There’s a long digression into the question of “the character clause” that is a key part of the book. Jaffe digs into the ongoing problems created by the 5% rule, the ever-changing veterans’ committees, and of course, the question of who took what 20 years ago and how they might be punished by the gatekeepers. For more than 20 years, I’ve said that you can’t argue about the Hall of Fame if you haven’t read The Politics of Glory. 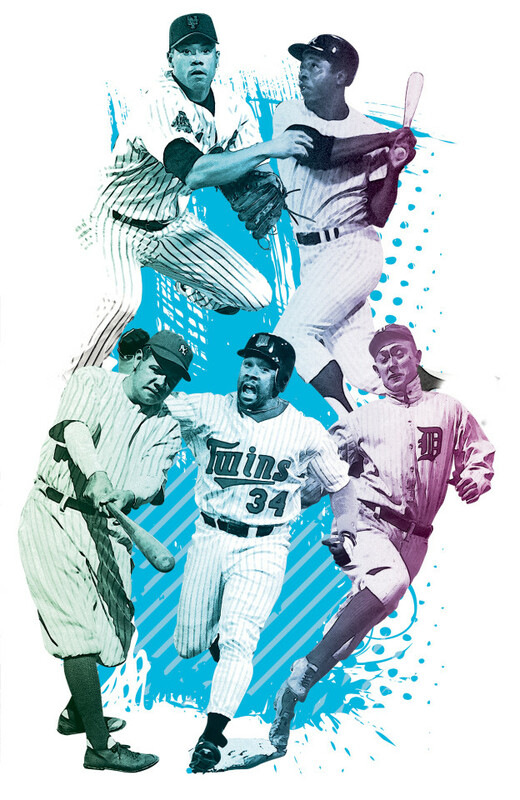 The details of the institution’s history, the voting process through the years, the way in which the 1946 Old Timers’ Committee forever skewed the honor…you had to know these things to discuss Bert Blyleven or Jack Morris or Tim Raines. It was the one essential book. I am comfortable in saying that there is now a second. The Cooperstown Casebook is critical to an understanding of what the Hall is now, in 2017, how it got here, and how it can get through the next 20 years. It’s also a deeply-researched reference on Hall of Famers old and new, a collection of passionate arguments for players shorted by the process, and most importantly, an entertaining read. If you are interested in the Hall of Fame on any level, you have to read this book. Throughout these chapters, which span the first 104 pages of the book, Jaffe is economical with his words, which allows each essay to flow very quickly. Note the breezy and concise way Jaffe recounts history, walking the reader back through events they likely already know, but not in a condescending way. It reminds the reader of the main bullet points, but doesn’t drown them in minutiae. He also spices the text up with gems like the Tom House quote, and noting the Red Sox fans taunting Canseco, something I didn’t remember even as a Red Sox fan (though to be fair, I was nine at the time). Those small points show that he really does know what he’s talking about. These examples, obscure yet pointed, demonstrate that if he needed to, Jaffe could have dropped another half-dozen anecdotes into these three paragraphs, but that’d be beating you over the head and he wisely doesn’t do that. …The Cooperstown Casebook is a book nearly 15 years in the making, and it was most certainly worth the wait. The book is a master stroke for Jay Jaffe, and if you consider yourself a serious baseball fan, it’s a book that you need to add to your bookshelf post haste. I couldn’t ask for a better review! “The Cooperstown Casebook” is essential reading for all baseball history enthusiasts and is recommended for anyone interested in intelligent discourse about the Hall of Fame. Jaffe writes informative, entertaining capsules about every player enshrined in Cooperstown, from inner-circle members to the most dubious Veterans Committee selections. He devotes space to more than 50 additional players who deserve at least some consideration for the Hall, saving the most deserving for pullout essays that precede each of the “Around The Diamond” chapters. …It is the most comprehensive, most enjoyable evaluation of the Hall of Fame since [Bill] James two decades earlier. I know I will return to “The Cooperstown Casebook” year after year to get my Hall of Fame fix. The co-author of an acclaimed book that I can’t wait to read later this summer — Fastball John, written with heat-throwing 1970s journeyman pitcher John D’Acquisto — and the founder of Instream Sports (“the first athlete-author website”), Dave Jordan combined a lengthy review of The Cooperstown Casebook with an epic Q&A, then studded it with some fun videos relevant to the topic at hand. You’ll want to pack a lunch for this one. This is a fantastic reference tome, and yet for guys like me who were more Zander Hollander than Bill James growing up, you’ll find the individual career recaps reminiscent of The Complete Handbook of Baseball, if not the late 90’s-early aughts STATS Inc Scouting Handbook annuals. What sets the 400-plus page book apart from those that preceded it is Jaffe’s sensitivity to historical context, in addition to his passion at seeking as impartial a determination of greatness as possible. It’s also a classy touch that he uses the introduction to applaud every single ballplayer who ever stepped over the white lines in an official Major League game. Jaffe’s presentation betrays a nuance, a deft touch, whether it’s praising the achievements of a disgraced player or a social media pariah. A baseball writer and sabrmetrican, highly-respected by the younger statisticians in the sport, Jaffe displays a humanity for the achievements of these great men without losing objectivity, and in some cases, a biting sense of humor. Sports Illustrated writer Jay Jaffe won’t get to cast his first ballot in the Baseball Hall of Fame voting process until 2021, the mandatory 10-year wait after he became a member of the Baseball Writers of America Association while employed with the Baseball Prospectus. The irony is his one vote won’t nearly have the same impact as all the research he has processed for Hall deciders spanning the last two decades. In his latest and greatest public voting manual… Jaffe has no designs of ending enlightened argument that funnels into the imperfect media selection process. Q: If we take the book title as a statement rather than a headline, are we advocating the Hall of Fame membership that has voted over the last 70-something years needs a do-over? Could we wipe everything clean and pick 325 players in one massive re-election? A: That’s a bit of a red herring. I don’t advocate we remove anyone. If you ask me about players who don’t belong, sure, I could start with Tommy McCarthy (outfielder inducted in 1946) or some others that are listed as “dubious” in the book. But I spent my time on this book actually trying to understand why those guys that I’d kick out are in, and how they got in, and what they did bring to the game. It’s too late to evict anyone. No one should pack their plaques. It’s all part of the game’s history and how our definitions of what a Hall of Famer changes. There’s nothing set in stone. After the original five went in (in 1939 – Babe Ruth, Walter Johnson, Honus Wagner, Christy Mathewson and Ty Cobb), we may have had stars of the game but there was a dearth of statistical information. No Baseball Encyclopedia to compare guys or even for player to know where they stood. If players like Sam Crawford (elected in 1957 with 2,961 hits) or Al Simmons (elected in 1953 with 2,927 hits) knew they were short of 3,000 hits, maybe they would have played longer to achieve that, but maybe they weren’t aware of those milestones. Interpretations change. Now we compare players better and we should just do a better job of choosing going forward. We have better tools to examine careers. As has been the case since they reached the 2013 Hall of Fame ballot and received less than half of the votes needed for election, the omissions of Barry Bonds and Roger Clemens threaten to overshadow the weekend’s induction ceremony. 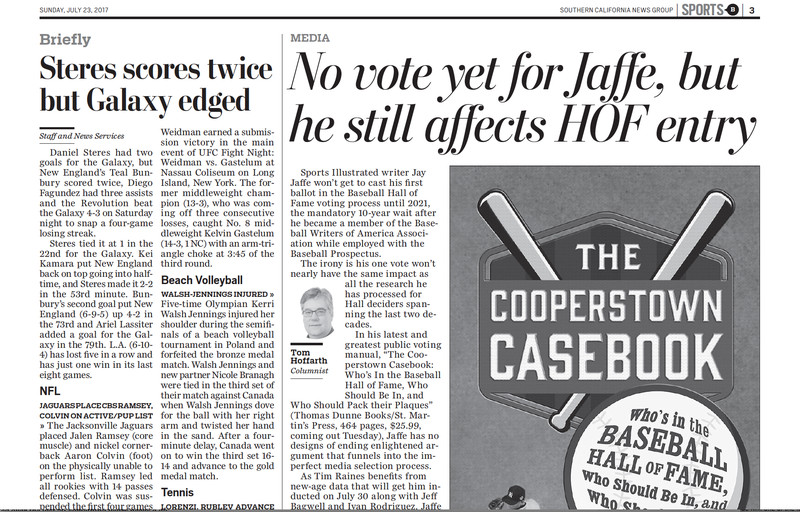 In the July 22, 2017 edition, the Post’s Larry Getlin guides a thorough walk through Chapter 8 of The Cooperstown Casebook, “This is Your Ballot on Drugs,” which explores the long history of performance-enhancing drug use within the sport as well as the so-called “character clause” that many voters cite when omitting Bonds, Clemens, Mark McGwire, Sammy Sosa and others from their ballots. I wish that Getlin had at least mentioned the other aspects of the book — the nearly 300 players whose cases are covered at length or in brief, the history of the institution’s formation and the various trends that shaped it, but I’m not going to complain about having nearly 1,500 words devoted to it in a major New York daily. “Hall of Famers from Willie Mays, Mickey Mantle and Hank Aaron to Mike Schmidt, Johnny Bench, Willie Stargell, and Frank Thomas have been connected to amphetamines, some by their own accounts, and they were hardly alone,” writes Jaffe. Even steroids themselves, basically the same drugs considered the scourge of baseball over the past two decades, were used openly prior to that period. A former pitcher named Tom House told a reporter that performance-enhancing drugs “were widespread in the game in the 1960s and ’70s,” Jaffe writes. For those who like to wade into the statistical weeds of baseball – to analyze player performance using today’s advanced metrics – “The Cooperstown Casebook” delivers. Not to be confused with Blue Jays general manager Ross Atkins, a name that’s sure to be in the news as the July 31 trade deadline approaches. This one is strictly for hard-core fans, and it’s sure to generate heated debate. I’ll beg to differ on that score, but I appreciate the coverage!